With Rivermead unavailable Rockets played this game at their training and academy venue, The John Madejski Academy. Two of the young Academy students played major roles in this vital win that sees Rockets up to 5th place in the league, as 16 yo David Chive made a steal with just 4.6 secs remaining and then hit both free throws in an ice cool manner to see Rockets secure the game. Arinze Emeka Anyakwo had his best game at this level by far as he knew before tip that captain Danny Carter was side-lined with his ongoing back strain so put in the performance of his Senior season as he top scored with 22 points and was a major trouble to Cavaliers from tip to buzzer. With both teams playing the night before and not getting back till the early hours of Sunday, both Head Coaches would have been conscious of tiredness and concentration maybe creeping in as the game progressed but neither had any such worries as the game was extremely tight from tip to the last play which quarter differences of just 1, 2, 1 and 3 show. 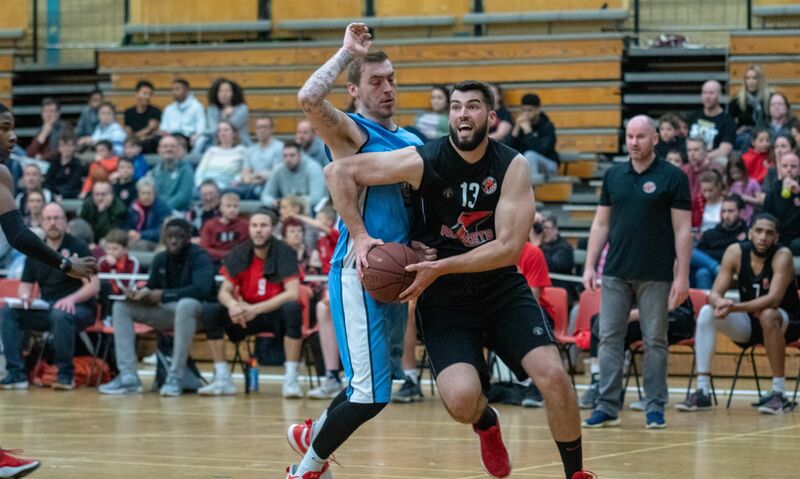 The opening 10 points were shared as Emeka Anyakwo hit 5 of them before A J Carr stroked a big treble and added 6 personal points but having had a 17-9 lead Rockets had a 13-4 reversal to be adrift 21-22 at the end of the quarter. Period 2 began with the lead being swapped by virtually each offense. Sydney Donaldson and Trae Pemberton stroked trebles as the game hotted up and Tanner Kuehn was secure from the penalty stripe. A Cavaliers tip in with the last play saw Rockets ahead but just by 40-38. Some strong defence helped Rockets to extend their advantage at the start of the third period whilst Pemberton and Chive were on the money beyond the arc. Within 4 minutes of the re-start Rockets enjoyed their best lead of double figures at 50-40 but Cavaliers hit back with a 15-5 run to draw level on 55 apiece before Donaldson hit a free throw to see Rockets go into the final stanza with a single point lead of 56-55. Cavaliers took the early lead before Donaldson struck a treble but the game was soon tied on 59. A Cavaliers treble, one of just 2 successful ones during the whole game for them, edged them ahead and with 2 minutes 20 sec to go Rockets were 3 down. An assist from Carr to Emeka-Anyakwo saw him draw Rockets level on 66 with a key treble. Carr scored inside with 1.06 left but Cavaliers had possession. Rockets stopped them scoring and then and having had a shot rim out, Rockets needed another stop. And how they did it as 16 yo Chive made a steal and held on to the ball as he was fouled. With huge confidence the youngster hit both free throws to give Rockets a virtually unassailable 4 point advantage with just 1.9 secs on the clock. Cavaliers hit a single point but the sweet victory belonged to Rockets 70-67 and a rise of 2 places up the league table to 5th with just 4 games remaining, the final 2 being at Rivermead on 24th and 31st March. Top scorers for Rockets were Arinze Emeka-Anyakwo with 22 pts and 6 rebounds ably assisted by A J Carr with 16 pts and 7 rebounds coupled to 4 assists and 3 steals. Trae Pemberton had recovered enough to score 15 pts, take down 7 rebounds and make 3 assists with Sydney Donaldson nearly having a double double with 8 pts and 10 rebounds. Head Coach Alan Keane travelled to Kent in the knowledge that all his squad were fit for the first time since early season and ready for the March madness of league games as Rockets vie for a play-off spot. However an early injury to American shooting guard , Trae Pemberton scuppered Keane’s plans and put extra pressure against the very fast and furious Barking team. Keane was pleased to see Sam Grant shirted up again and gave him plenty of court time as he re-introduced the 16 yo to Senior basketball. The long journey to Canterbury, most in darkness, was not helped when the tip was delayed until 8.50 pm, yes 8.50 pm. The opening two minutes saw nobody troubling the scoreboard but then Barking stroked the first of their trebles before teenager David Chive saw Rockets first points go on the board. Captain Danny Carter was playing well at both ends leading by example whilst A J Carr caused trouble for Barking with his inside presence which he coupled to hitting his first treble. Sydney Donaldson took an assist off Chive to give Rockets a four point advantage but a 6-0 Barking finish edged them ahead 20-18 at the first break. Adrian O’Sullivan drove to score but went over on his ankle and Rockets supporters and bench looked as he limped away, knowing he’s just come back from a month out of the team. What a relief when after a couple of minutes he was running quite freely . Carter was again dominant inside, influential on the boards and made a big rejection to stop Barking. 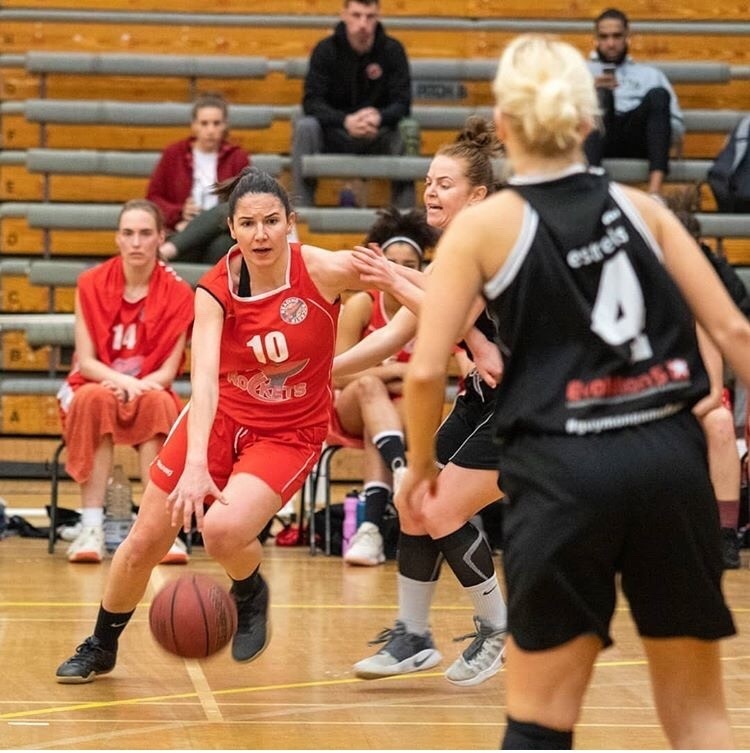 The game was again tied on 30 points each but a brace of trebles and secure from the free throw line saw Barking head to the locker room with an extended advantage of 44-38. A ten point personal haul by O’Sullivan including a pair of trebles kept Barking honest and Rockets in the game whilst Carter drove and scored with a reverse lay-up, hit a down town treble and gave an assist to Grant to score his first points after the 4 week lay-off. A buzzer beating treble from Donaldsonwas one of the highlights of some excellent Rockets team play as with four minutes of the third period remaining Rockets trailed by a single point at 58-59with a 14-5 run having been eleven behind at 43-54. 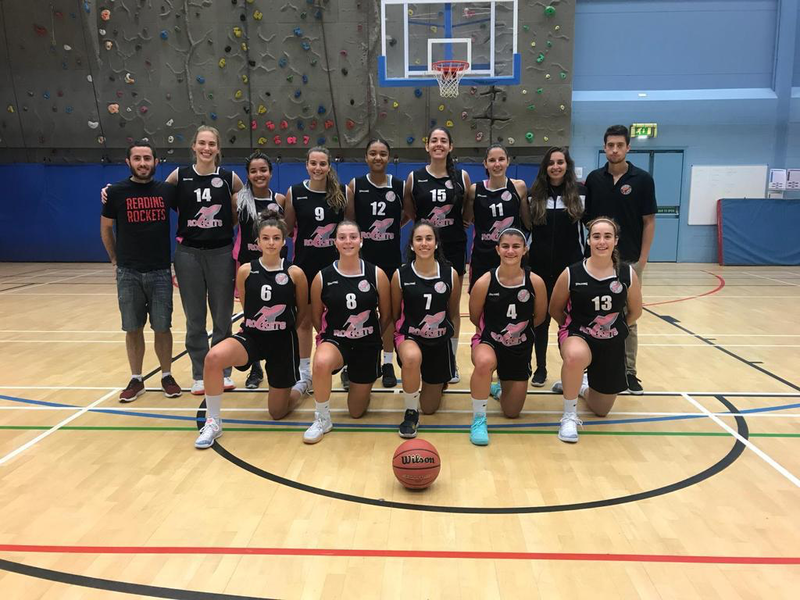 A 10-4 Barking run at the end of the quarter aided by four from the line and a three point final play saw Rockets adrift 62-69 as the final quarter beckoned. Either side of the end of the last period and beginning of this one, Rockets couldn’t buy a bucket as the ball just wouldn’t drop and after a 7-0 Barking run Rockets found themselves fourteen points down at 62-76. Despite Donaldson being called for his fifth and excluding foul, Rockets fought with four trebles from O’Sullivan, Carter and a brace from Carr but their efforts ended in vain as Barling took the win 95-84. 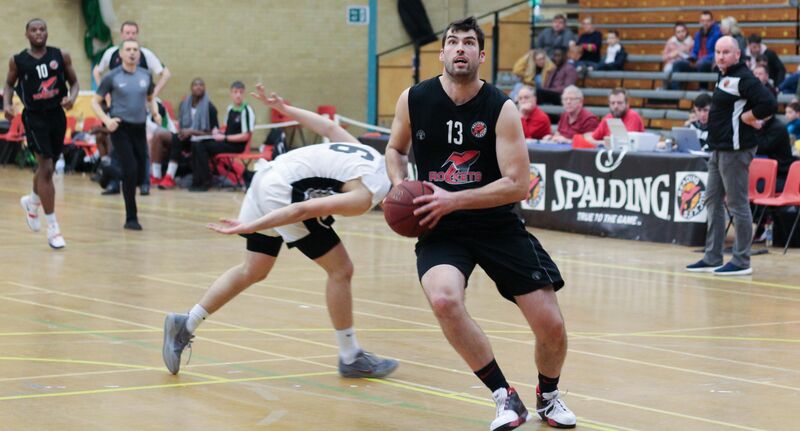 Tops corers for Rockets were A J Carr with 24 points, Danny Carter with 19 pts and Adrian O’Sullivan with 17 pts.